A campaign to honour the hard work of international students and new immigrants is now endorsed by the City of Vancouver. You may remember reading an article in one of the previous issues of Guidebook about Make It Count, a youth-led campaign aiming to get graduation credits for English Language Learner (ELL) classes in B.C. schools. While the petition closed earlier this year, the Fresh Voices youth advisory team is still on the case. Fresh Voices is a group of immigrant and refugee youth supported by Vancouver Foundation and the BC Representative for Children and Youth working to affect policies impacting newcomer youth in B.C. In 2011, the group organized a summit for immigrant and refugee youth across the Lower Mainland to have the opportunity to talk about what issues affect them and offer solutions to those issues. This sparked a series of regional mini-dialogues around the province. In 2013 the YAT took findings from these dialogues and compiled them into a report filled with 16 recommendations to the provincial government. From there, the Fresh Voices team decided to focus on one main recommendation: getting graduation credits for ELL courses is high schools across B.C. There was a website, a video and a petition, and now after the tidal wave that was the Make It Count campaign, you may be wondering: What next? Well, Fresh Voices have not been sitting idle for the past year. 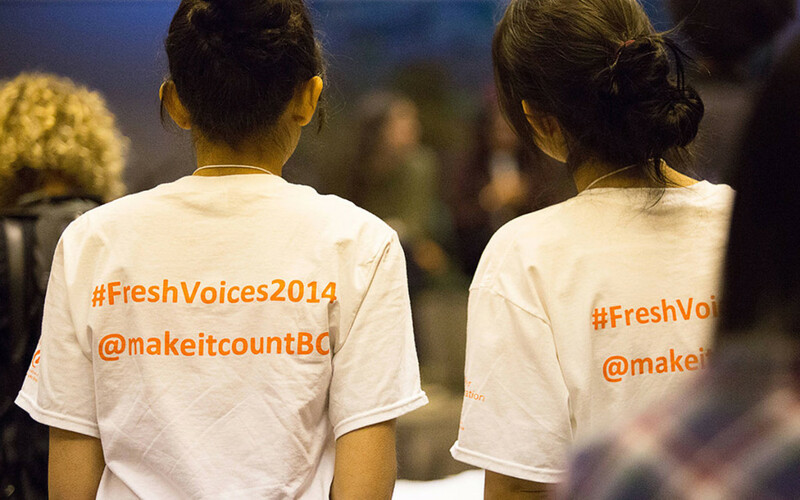 Between attending bi-weekly meetings and and presenting at events around the Lower Mainland, Fresh Voices also arranged a meeting with the Education Minister, Peter Fassbender, to talk about Make It Count and the recommendation to implement a credit system for ELL courses. Although no concrete action has been taken by the ministry yet, the conversation is a step in the right direction, and it’s just the tip of the iceberg. Another highlight of this year was the renewal of membership, as the Fresh Voices team welcomed a new wave of newcomer youth and youth workers to offer their voices and stories. The new members hail from all over the world and are scattered across the Lower Mainland, strengthening the diversity and collective voice of the Make It Count project. Shortly after the integration of new members came the happy news that Vancouver’s city council passed a motion to endorse not only the Make It Count campaign, but the entire Fresh Voices report including all 16 recommendations. This adds to a growing list of endorsements from organizations and individuals that want to show their support. On October 14 the motion was passed unanimously and the City of Vancouver officially came on board the Make It Count train. Now, after three years, the Fresh Voices team is organizing another forum that will take place on December 8 and 9, featuring a keynote address by Jean Augustine, a former Federal Cabinet minister for Multiculturalism. Other presenters include community leaders and Fresh Voices members alike. The first day will be a youth-only space where attendees can talk and share their experiences in a less intimidating setting. The second day will add in adult allies and decision makers, ending the forum with an opportunity for the youth to talk to the people who could be instrumental in making their ideas into realities. The Fresh Voices team hopes that Minister Fassbender will also be in attendance, and the youth eagerly awaiting a response to the invitation. There are bright things ahead for the Make It Count campaign. Follow us on Twitter @makeitcountbc or find us on Facebook for more updates as we get closer to the forum. Tanvi Bhatia is a regular contributor to Guidebook, and a member of the Fresh Voices youth advisory team.